Professional footballers and cricketers are three times more likely to have gambling problems than other young men, according to research. 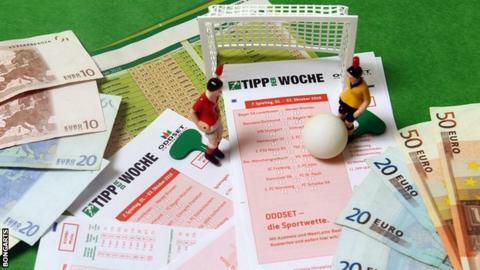 A study conducted for the Professional Players' Federation shows 6.1% of sportsmen would be classed as problem gamblers compared with 1.9% in the general population of young men. PPF chairman Brendon Batson says the findings are "worrying" for sport. "Sportsmen are a clear 'at risk' group and sport has a duty of care," he said. "We all need to work together to expand and improve the good practice that exists on education and treatment for problem gambling." The research was based on confidential questionnaires from 170 professional footballers and 176 professional cricketers. Heather Wardle, research director at NatCen Social Research which carried out the study, added: "It is interesting to question why this might be. Is it due to a betting culture? Is it something about athletes' personalities or perhaps a combination of these two?" A year ago, the Sporting Chance rehabilitation clinic claimed footballers were taking out pay-day loans to fund gambling addictions and that 70% of its referrals related to gambling. Former Tottenham and Stoke winger Matthew Etherington and ex-Manchester United and Newcastle winger Keith Gillespie are among those to have admitted having gambling problems in recent years. Ex-New Zealand and Gloucestershire batsman Craig Spearman also revealed he was a compulsive gambler at the height of his career.